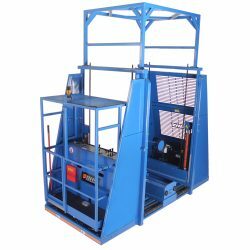 BHS Triple Stack Battery Extractors (BE-TS) travel safely up to three tiers high, providing quick and reliable transportation for forklift batteries of virtually any size. The BE-TS is ideal for expanding battery collections, and provides particular benefit to forklift fleets that use between 150 and 299 batteries. The BE-TS features a heavy duty steel frame, dual battery beds with powered rollers, and a unique extractor arm for added efficiency. Twin chromed and hardened shafts guide extractor arm travel, with four-point bearing contact contributing to the extraordinary stability of the extraction system. Vacuum grips treat battery cases gently and attach firmly to batteries in under a second, and optional magnetic extraction provides efficient changeouts for batteries with slim casings. Two independent drive wheels power floor travel. This synchronized drive system provides smooth travel in any conditions, and continues to function even if one side sustains damage. With a wide range of safety features built in and even more available as optional additions, the BE-TS keeps staff and infrastructure safe and productive. Call our sales team at +1 314 423 2075 to learn more.